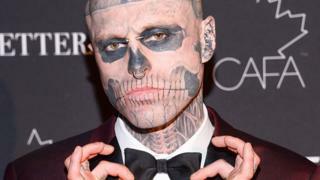 Lady Gaga has paid tribute to model Rick Genest, who has died at the age of 32. Rick was known as Zombie Boy, due to bone and organ tattoos across his body, including skull features on his face. He was found dead at his home in Montreal, Canada and it was widely reported that he had taken his own life. Rick appeared in Gaga's Born This Way video in 2011 and the singer says the loss is "beyond devastating". "We have to work harder to change the culture, bring mental health to the forefront and erase the stigma that we can't talk about it," she wrote on Twitter. "If you are suffering, call a friend or family today. We must save each other." She followed this by sharing a photo of herself and Rick - and urging fans who might be struggling with their mental health to "reach out". Rick modelled for French fashion designer Thierry Mugler, appeared in Vogue Japan and was once the face of Jay-Z's Rocawear fashion label. He was 32 at the time of his death. His body was found six days before his 33rd birthday. Rick's management posted a tribute on Facebook, saying they were "shocked and pained" by his death. "Rico was loved by all those who had the chance to meet him and know him," said the post. "We received the unfortunate news at the beginning of the afternoon and members of the team have come to support his family and relatives in this dark and difficult moment. "We want to present our deepest condolences... Thank you zb for these beautiful moments in your company and for your radiant smile." If you are in the UK, you can call the Samaritans on 116 123 if you are struggling with mental health issues. You can also get help at the BBC Advice pages. William Barr says he does not believe the president's actions amounted to obstruction.